The 109th Louisiana State Conference convened on March 16 – 18 at the Renaissance Hotel in Baton Rouge, Louisiana. The first business session was called to order on Thursday afternoon, with our Conference Guests arriving just in time to attend. Reports from our State Officers, District Directors and Chapter Regents were given. It was announced that the ground breaking for the State Regent’s project will take place on the site of Caroline Dorman’s Birthplace at Briarwood to be held May 5, 2018 at 1:00 pm. This is the first important step so that construction can begin on the Education Pavilion to tell the story of all that Caroline Dorman’s contribution to conservation and historic preservation for Louisiana. She was the first woman hired by the US Forest Service. We hope to mark her grave, located in the Baptist Church Cemetery near Briarwood, Louisiana, next spring. Thursday evening the State Officers and State Regents Club dinner was held at the Country Club of Louisiana on Historic Highland Road. President General Ann Dillon arrived just in time to enjoy the scenic drive to the Club House with the Azalea’s in full bloom followed by lots of Southern Hospitality. After a brief meeting by both the State Officers Club and the Chapter Regents Club we were presented with Felicity and Bernardo Galvez “A Legacy to Louisiana” adapted by Lauren Pourciau Durr, LSDAR Second Vice Regent as Felicity dressed in period costume and music by New Iberia Regent Brenda Lowry. It was an inspiring evening to begin our Conference. Friday morning, following a continental breakfast, we traveled a short distance to Saint Jude the Apostle Catholic Church for our Memorial Service. Gwen Sealy, Past NSDAR Reporter General and State Regent 1998-2001, was remembered along with 10 Past Chapter Regents and sixty-seven chapter members. 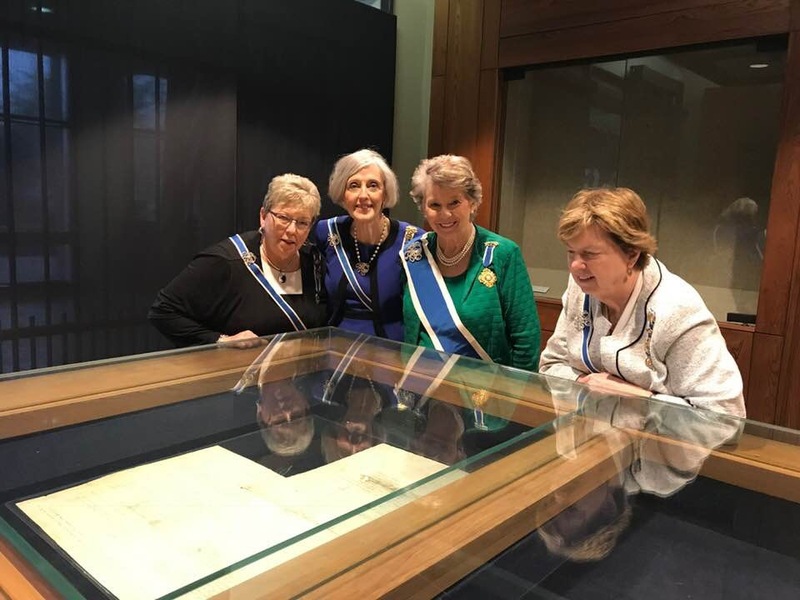 Following the Memorial Service, arrangements had been made for our guests to visit the Louisiana State Archives to see a document that granted land from the Indians to the State of New York signed by George Washington. The National Defense Luncheon guest speaker, Louisiana State Senator Robert Adley, gave a lively address. Following the luncheon we met for the afternoon session Rachel Lipsetts, NSDAR Development Staff, informed us about the Heritage Club and various ways to support the National Society through our donations. Following the afternoon business sessiona Tea was held to thank Heritage Club members for their support. LSU Army ROTC “Pershing Rifles” Cadets presented the Flag of the United States of America for our evening ceremony. After opening remarks and introductions, our Conference Guests, New York State Regent Nancy Zwetsch and Ohio State Regent Nancy Wright brought greetings. Rachel Ross, Page Chairman, introduced the pages giving each a certificate for their service. We had 18 pages with one visiting from Texas, these Juniors are our future! Following was the introduction of President General Ann Turner Dillon who presented a most thoughtful and inspiring speech. A check was presented for the President General’s Project from LSDAR. Chapters were then presented certificates for 100% participation in the President General’s Project by Mrs. Dillon. Then Louisiana Chorus presented a lovely musical tribute and the American History Teacher of the year was honored. Twenty- eight graduates of the New Horizons and New Member Courses were honored with certificates, cords and a small gift by our President General, State Regent and State Organizing Secretary. Saturday a Cameo Club Coffee was held and Junior Membership sales were busy as everyone enjoyed free time to visit with friends and make new ones. The last business session opened and chairmen gave the reports of State Committees. Before we bid our President General Ann Dillon farewell a Louisiana charm in a lovely LSU make up bag was presented, she was not to sure if her Aggie husband would take kindly to any LSU item coming in to the house! Invitation to the 110th State Conference in Lafayette,LA was issued in French and English by Louisie Ganucheau Regent of Galvez Chapter and SW District Director Cheryl Gott. Louisiana Daughters continue Preserving the Path for Others to Follow in Service to Others.